While most manufacturers follow the herd, with their straight lines and black or silver finishes, HANNspree brings the fun back into TV design. Its global range includes sets in the shape of giraffes, fire engines and even basketballs. 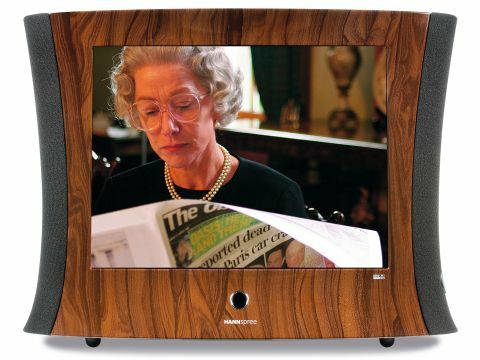 The Hannsvaas is one of its more normal looking TVs, but it's still nothing if not different, thanks to its radical curves, polished walnut woodgrain finish and solid build. S-video, Scart and composite sources are piped in via a single, multi-purpose 9-pin jack and some (provided) adaptors. As well as making setup fiddly, this limits the number of video sources you can connect to the TV at one go. At least the set does have its own PC and RF tuner ports. A search for features is hindered by a bad operating system that combines a bland, largely buttonless remote with onscreen menus that are unreadably small and react frustratingly slowly. It's just as well, there's nothing in the menus worth troubling you with. Although the set's beauty isn't completely skin deep, its picture quality can't be rated anything better than average. Black levels are rather weak, bottoming out into grey so that dark scenes look fl at and devoid of shadow detail. The same problem has a knock-on effect with colours, making tones such as skin look unnatural during darker scenes. The TV doesn't have a widescreen mode for showing anamorphic widescreen material and it falls prey to the common problem of backlight seepage along its top and bottom edges. And even quite slow motion looks fuzzy. On the upside, colours are rich during bright scenes, the backlight drives the picture out with plenty of punch, and detail levels are quite high when motion isn't softening things up. But overall, we feel slightly let down that this glamorous TV should produce such basically ordinary images.